May I ask what should be here the difference between saving and exporting in terms for later reusage? Right-click on the macro in the Library panel and choose Edit Macro. Then in the Macro panel, click the Export icon. What I mean by saved, is saved to the library. My thought: "Saving" is what you do if you want to keep a macro after you've recorded it. You use the "Add to Library" icon in the Macro panel. Exporting is what you do to transfer it someplace else, or make a backup copy for long-term storage. You could do that to an individual macro (see my response in the prior post) or you can export an entire category of macros via the Library panel. That gives me a .afmacro file. If I change it to .afmacros AF does not recognize it for import. That gives me a .afmacro file. If I change it to .afmacros AF does recognize it for import. A single macro must be a .afmacro file. You would import it using the Macro panel. I am able to export a category containing the macro I want to export. Import the category, move the desired macro to an existing category . Then delete the last imported category. Got it now. I assumed the import would be into the library. As you probably know by now, the .afmacro & .afmacros file formats are different, so just changing the file extension from one to the other won't work. An .afmacro file always includes only a single uncategorized macro, while an .afmacros file always includes zero* or more macros in a single category. * If you were wondering, it is possible to create an .afmacros file with zero macros in it, but importing it into the Library does nothing -- no new category is created. As you probably know by now, the .afmacro & .afmacros file formats are different, so just changing the file extension from one to the other won't work. An .afmacro﻿ file always includes only a single uncategorized macro, while an .afmacros file always includes zero* or more macros in a single category. 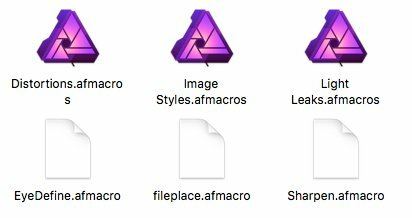 I also thought it was odd that the .afmacro file had no Affinity icon where as the .afmacros file does. afmacro files don't have an associated icon and if they had, it would probably be a good idea to distinguish those icons then visually from the other ones, in order to less irritate users between both of those macro file extensions and their overall usage handling. I am not sure if something similar applies to Windows but for Macs .afmacros files are assigned an Affinity icon for a good reason: they can be imported into the Library Studio panel simply by double-clicking on them in Finder. This is not true for .afmacro files, which can only be imported into the Macro Studio panel when a document is open. This also is true for the Affinity Photo customer beta if it is installed -- if it is, right-clicking on an .afmacros file displays both apps in the "Open With" submenu. This 'binding' of the .afmacros file type to Affinity Photo is created by an entry in the app's info.plist file, which the Mac OS reads so it can assign the app's "PhotoAppIcon" icon & the Kind label of "Affinity Library" to Finder windows, display the appropriate "Open With" items, & so on. It is the same mechanism that allows Finder to associate (bind) various file types like jpg, svg, psd, pdf, & quite a few others to an Affinity app.